Evoking the fires of inner Earth, glass blowers transform coarse sand into a glowing mass to create the globe's crystal sphere. Each finished Everest Globe is a piece of art, exhibiting slight variations in width, height and thickness to make it unique. 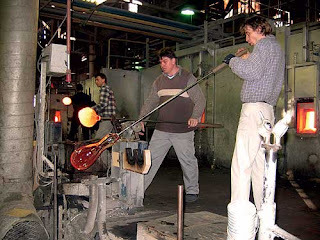 After the spheres cool, artisans painstakingly adhere the intricate two-sided map to the glass. 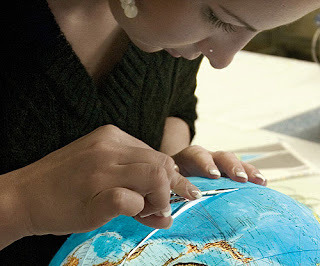 Only a few artisans remain who can produce a globe using this process. Trimming by hand, each section of the map is hand applied to the glass sphere until the world is complete. The final assembly of the map onto the glass sphere is then varnished and protected. Wood for the Everest Globe base comes from the Black Forest. National Geographic called together a team of talented European woodworkers to build one of the most well made pieces of furniture you will ever own. A beautiful focal point for any room, the base glows with a deep gloss finish that highlights the carved detailing on the rim and legs. Carefully lathed, carved and sanded, and finished by hand, each Everest Globe base exhibits qualities of balance and design uncommon in today's world. Delicate mother of pearl inlay graces the top of the base. From the depths of the ocean, they have chosen only the finest shells of non-endangered species to send to European artisans who specialize in heirloom-quality mother of pearl inlay. The polished brass meridian encircles the Everest Globe. The ornamental meridian on the Everest Globe provides the globe with an elegant longitudinal circumference. 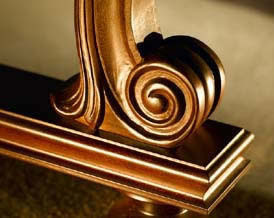 It begins as a flat band of solid brass precisely calibrated every ten degrees by an expert engraver. 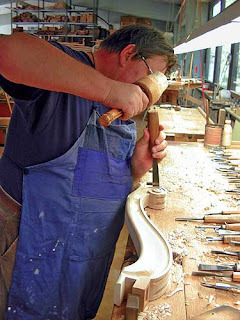 It is then curved by hand around a wooden form creating a structure that is both flexible and strong. Once bent, the meridian is hand-rubbed and lacquered to a gleaming shine. A small brass knob on the horizon ring allows adjustment of the meridian, while a felted brass catch prevents the globe from turning too far in its stand. Each Charter-edition Everest Globe comes numbered and dated. Only 250 globes will be made. Each will include a brass plaque engraved with the number of the globe, along with your personal inscription. It will also include a signed, numbered Certificate of Authenticity from the National Geographic Society. The quality of this globe is unsurpassed. When we had the opportunity to view some of the first arrivals we where pleased knowing that the expectations of our heirloom customers would be met with this beautiful piece of art. For more information on the Everest Globe, click here. New for 2008 and In collaboration with the Frank Lloyd Wright Foundation, Replogle Globes has designed a new Frank Lloyd Wright inspired line of world globes. Each globe stand in this line has been carefully handcrafted from designs found within the Foundations archive, some replicating notable production designs. The new line includes the Barrel and Wright Floor Standing Globes along with the Hexagon, San Marcos and Tabouret tabletop globes. Check out the entire line at Ultimate Globes and read more about the unique history of each design.